There are 82 Assisted Living Facilities in the Bethesda area, with 8 in Bethesda and 74 nearby. The average cost of assisted living in Bethesda is $4,719 per month. This is higher than the national median of $3,346. Cheaper nearby regions include Silver Spring with an average starting cost of $3,843. To help you with your search, browse the 327 reviews below for assisted living facilities in Bethesda. On average, consumers rate assisted living in Bethesda 4.4 out of 5 stars. Better rated regions include Mclean with an average rating of 4.5 out of 5 stars. Caring.com has helped thousands of families find high-quality senior care. To speak with one of our Family Advisors about assisted living options and costs in Bethesda, call (855) 863-8283. Located just outside Washington, D.C., Bethesda is one of the wealthiest and most highly educated communities in the country, as well as a hub for artistic and cultural events. As the city's population ages, a growing number of assisted living facilities have opened to help seniors age independently. Bethesda is home to eight of these facilities, while 52 more can be found in nearby towns such as Rockville, Silver Spring and Takoma Park. In Bethesda and throughout Maryland, assisted living communities are licensed as assisted living residences (ALRs) and regulated by The Department of Health and Mental Hygiene. Bethesda's climate will appeal to seniors who don't mind its sweltering summers, with an average high temperature of 88 degrees in July. Bethesda is an affluent city and its high cost of living, which is more than twice that of the U.S. national average, may put it out of reach for some seniors' budgets. 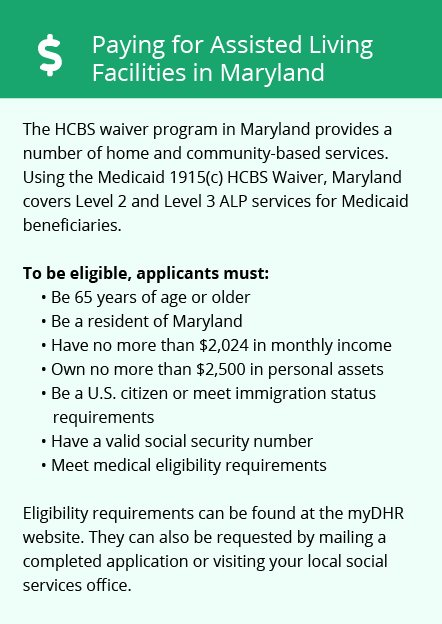 Maryland doesn't offer many tax breaks for seniors. While Social Security income is tax-exempt, other types of retirement income are taxable. Those seniors who are planning their estates should also be aware that Maryland levies both estate and inheritance taxes. Bethesda's diverse arts and culture scene offers something for all ages. In addition to shopping and dining, an assisted living center's outings could include catching a show at the Strathmore or Imagination Stage. Bethesda was ranked by one study as the most secure large city in the U.S. Seniors who choose to call Bethesda home can rest assured that its overall crime rate is below that of 65 percent of cities in Maryland. The Bethesda area is home to world-class medical facilities, including Walter Reed National Military Medical Center and Suburban Hospital, in the event of medical emergencies or illness. Assisted Living costs in Bethesda start around $4,719 per month on average, while the nationwide average cost of assisted living is $4,000 per month, according to the latest figures from Genworth’s Cost of Care Survey. It’s important to note that assisted living rates in Bethesda and the surrounding suburbs can vary widely based on factors such as location, the level of care needed, apartment size and the types of amenities offered at each community. 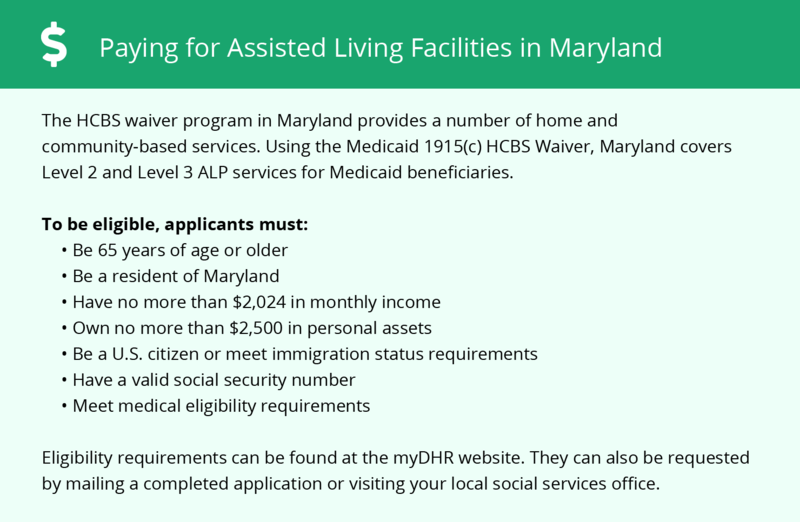 Maryland helps cover the cost of services in ALPs for eligible seniors under the Medicaid Home and Community-Based Options Waiver program. The state also offers subsidies for services in qualifying facilities through the Senior Assisted Living Group Home Subsidy program. Bethesda and the surrounding area are home to numerous government agencies and non-profit organizations offering help for seniors searching for or currently residing in an assisted living community. These organizations can also provide assistance in a number of other eldercare services such as geriatric care management, elder law advice, estate planning, finding home care and health and wellness programs. To see a list of free assisted living resources in Bethesda, please visit our Assisted Living in Maryland page. Bethesda-area assisted living communities must adhere to the comprehensive set of state laws and regulations that all assisted living communities in Maryland are required to follow. Visit our Assisted Living in Maryland page for more information about these laws.